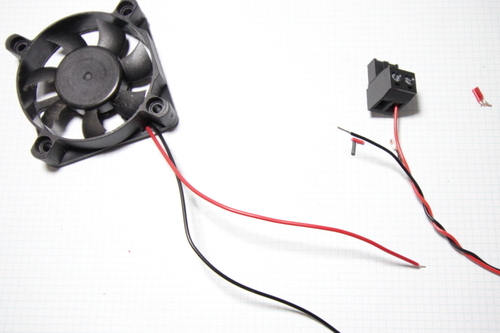 Below are instructions for rewiring the two 40mm fans for running at 24V. 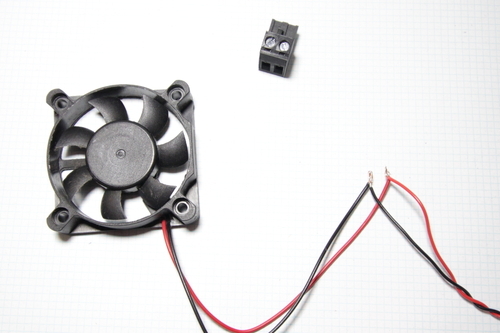 The electronics case fan and harness have been removed from the electronics case/printer for clarity. 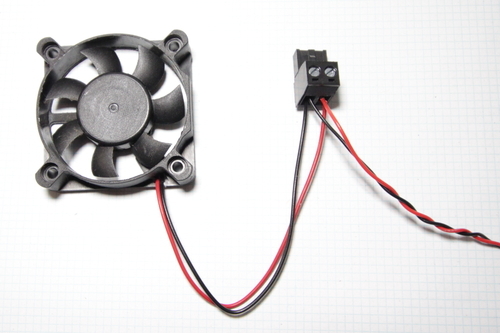 A picture of the original Fan1 40mm fan wiring, with the electronics case fan wired in parallel with the filament drive fan. Note the wiring orientation. First use a small flatheat screwdriver to loosen the two screws on top of the power connector to release the wires. 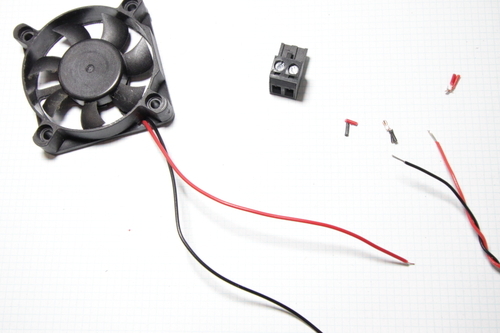 Once the wires are free of the connectors, snip the ends off of all four wires (just a bit past the stripped section). Then strip the wires again (~1/8"-1/4"). 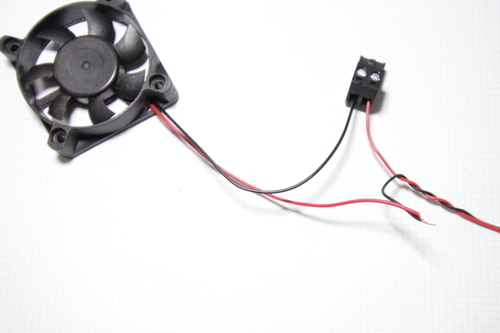 Insert the red wire from the harness, which runs to the filament drive fan, into the right socket on the power connector, and tighten the screw until the wire is secure. Twisting the wire, folding it over, and lightly twisting again may give the connector a better surface to grip. 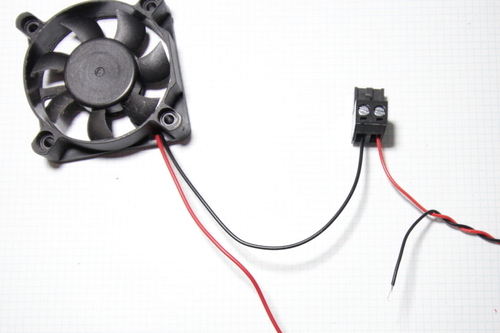 Insert the black wire from the electronics case fan into the left socket on the power connector, and tighten the screw until the wire is secure. Twisting the wire, folding it over, and lightly twisting again may give the connector a better surface to grip. 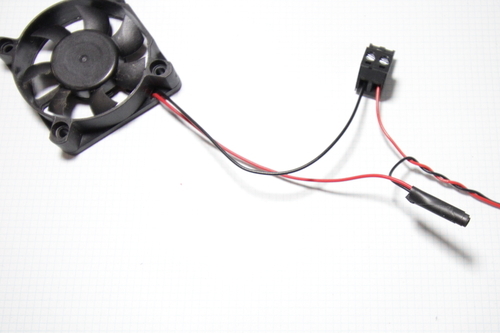 Twist the black harness and red electronics case fan wires together. If you have access to a soldering iron, solder this joint as well. This connection needs to be very secure. 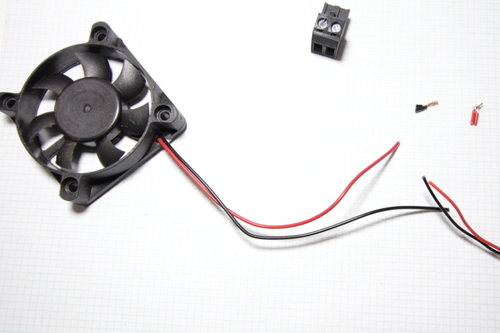 Cover the twisted connection with electrical tape (or, if available heatshrink). 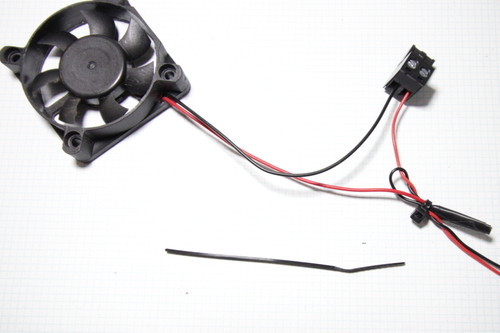 To protect the twisted (or soldered) connection, use a ziptie to secure the connection to the red harness wire. Snip the excess ziptie length. 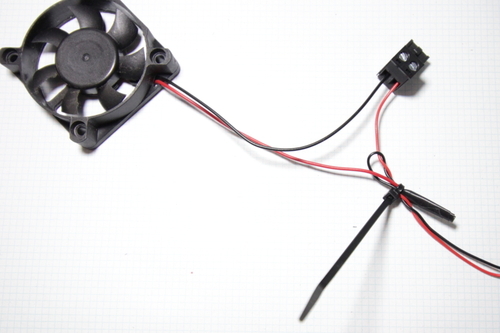 Double check that all connections (both to the power connector, and the connection between fan and harness wires) are secure before reconnecting the Fan1 connector to the RAMBo.